Going on food trails has always been exciting for me, especially while travelling to new places. Soaking in the culture is an essential part of my travel experiences. Food is an obvious and important part of any culture and tasting local cuisines is hence a must do in each trip. Keeping aside the hygiene factor for once, let me boldly state that you would find the true essence of local cuisines in roadside dhabas or street vendors. They are the ones who have kept the specialty and authenticity alive. 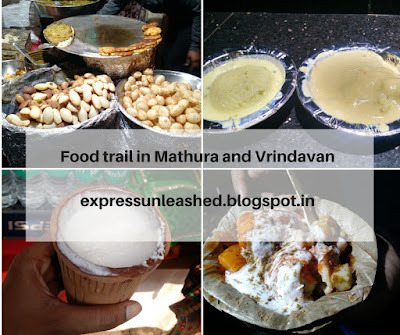 Here is my food trail experience was on the streets of Mathura and Vrindavan in Uttar Pradesh. 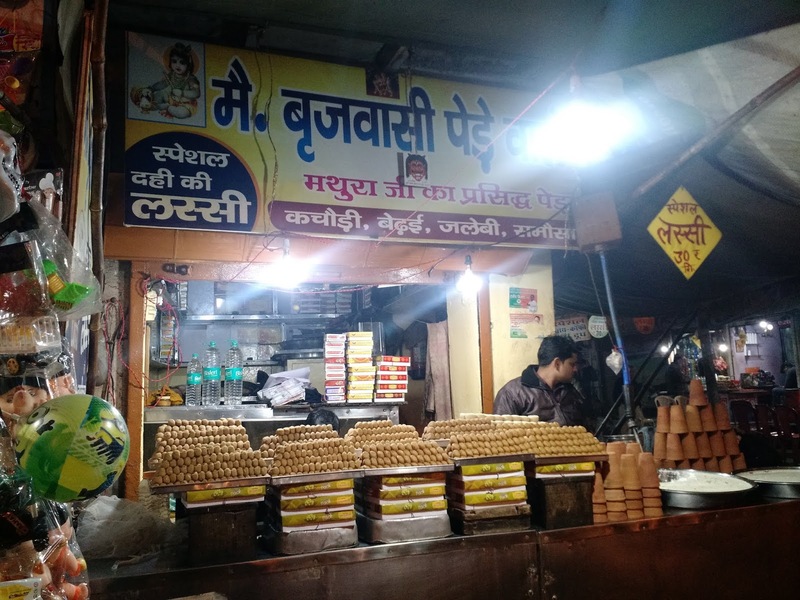 My first food experiment was in the market at Sri Krishna Janmbhoomi Temple, the very place where Lord Krishna was born to Devki and Vasudev in Kansa's captivity. 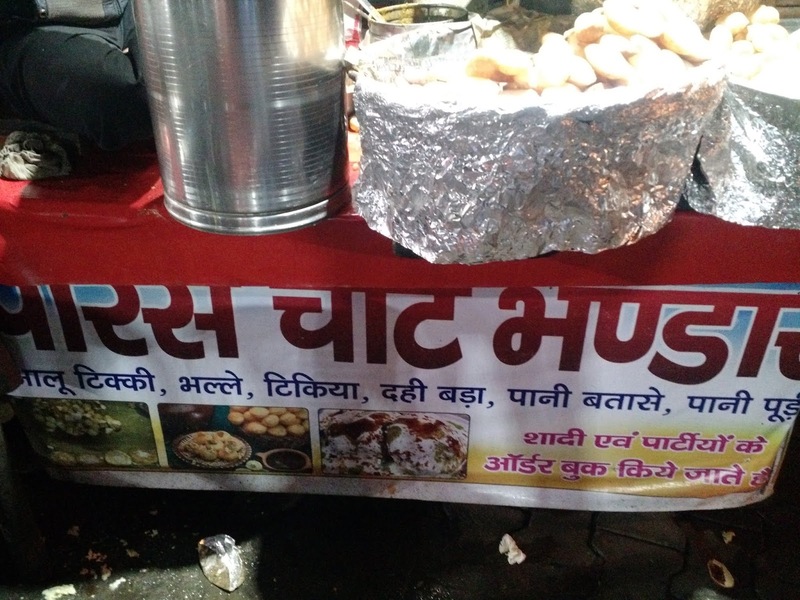 I started my chaat spree from a tiny stall named Paras Chaat Bhandar. The honest vendor served great assortment of chaat and ofcourse was reasonably place. Each bite burst with spices in my mouth. Tangy and chilly, I must say that the chaat palate in U.P is the best in India. Infact I had developed a liking for chaat in childhood after I tasted in U.P. 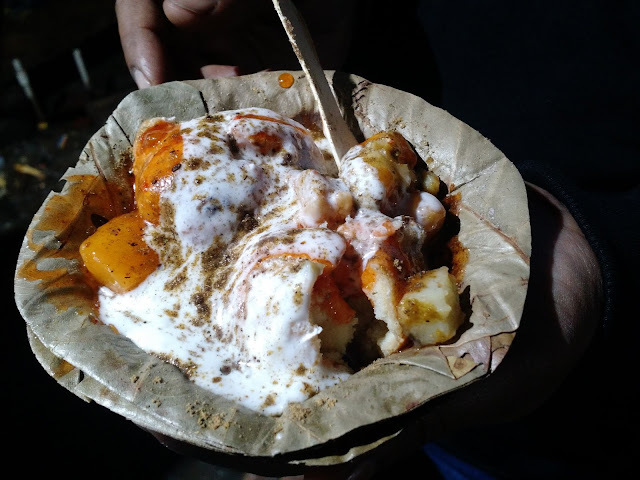 A scrumptious chaat meal is always followed by desserts and what's better than hunting for sweets in Mathura. Being the birthplace of Lord Krishna, Mathura is known for excellent milk based sweets After all they were the favorites of the Lord. I went searching for peda. Made of khoya (milk residue), sugar and flavoured spices, peda of Mathura is popular across the nation. 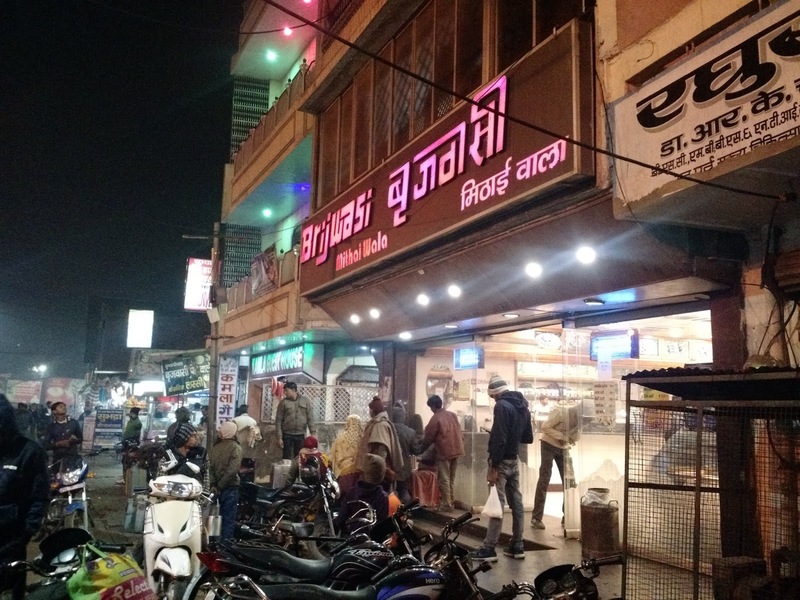 India's best pedas are found here. 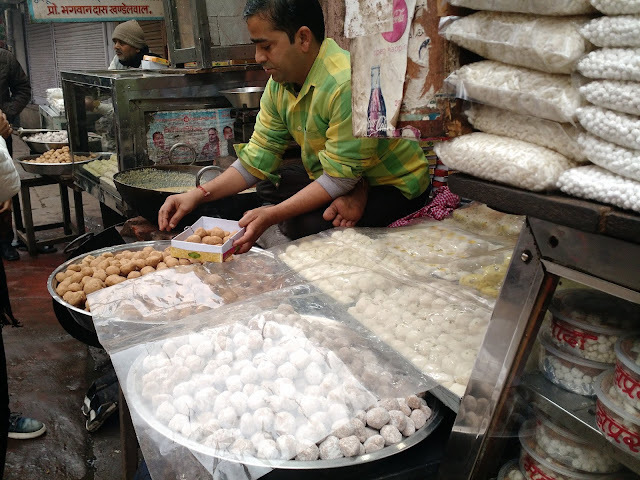 I went searching for sweet shops in the market close to Shri Krishna Janambhoomi Temple. and there was no dearth of sweet shops. Apparently every second shop in Mathura is named Brijwasi Sweet Shop. I ditched all shops in the vicinity. 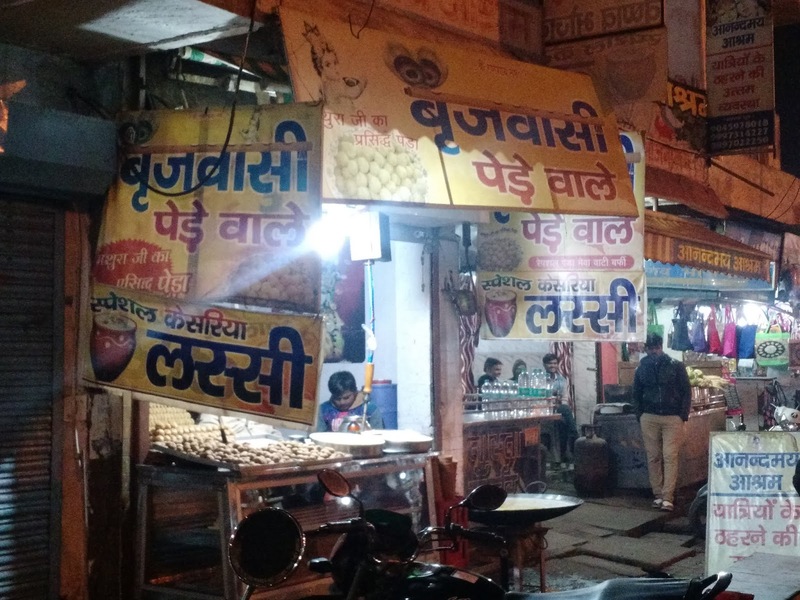 My hunt for good pedas ended in a peda shop near Dwarkadhish Temple. The brown ones are pure khoya which have shelf life of 2 weeks and the white ones (covered) have punch of cloves and they last for 2 months. Pedas just melt in your mouth and I could not restrict myself to just one. Also, as I said chaat from Uttar Pradesh is the best in India, one cannot afford to miss the crispy kachori here. Stuffed with daal or onion and spices, these crispy bites are served with potato gravy or sweet sauce. The best part, they are served in bowls made of palm tree leaves. 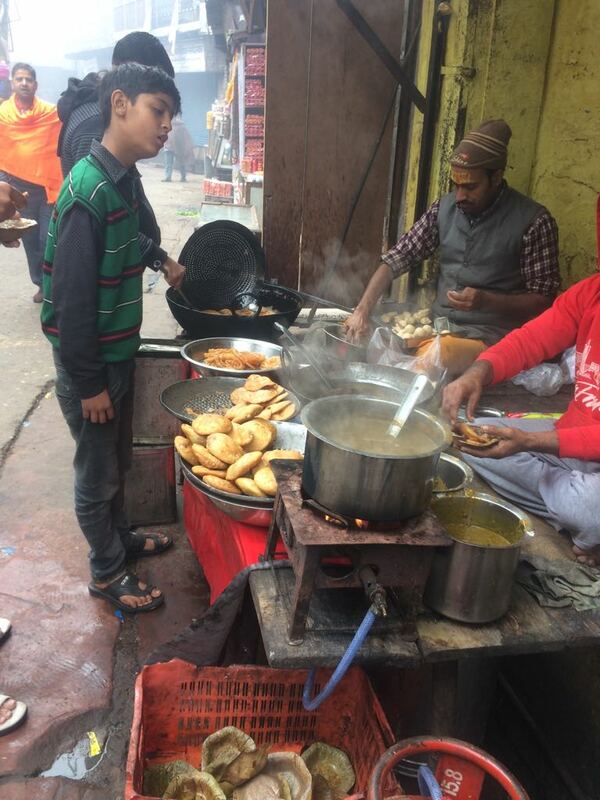 Being close to the temple vicinity, most of the shops prepare food without onion but there is high on spices. The fresh preparation on a chilled winter morning was an appealing sight. However I resisted the temptation. 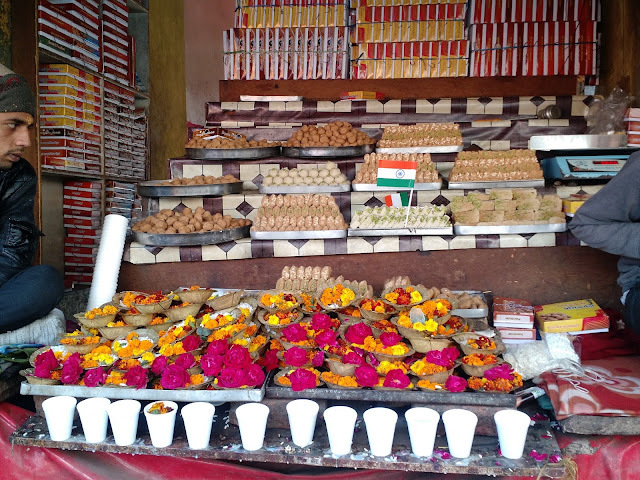 The following day of my visit to Govardhan Temple, nothing could separate me from sweets again. This time, the sweet shop was a footwear deposit stoppage since the main temple had no footwear counter. 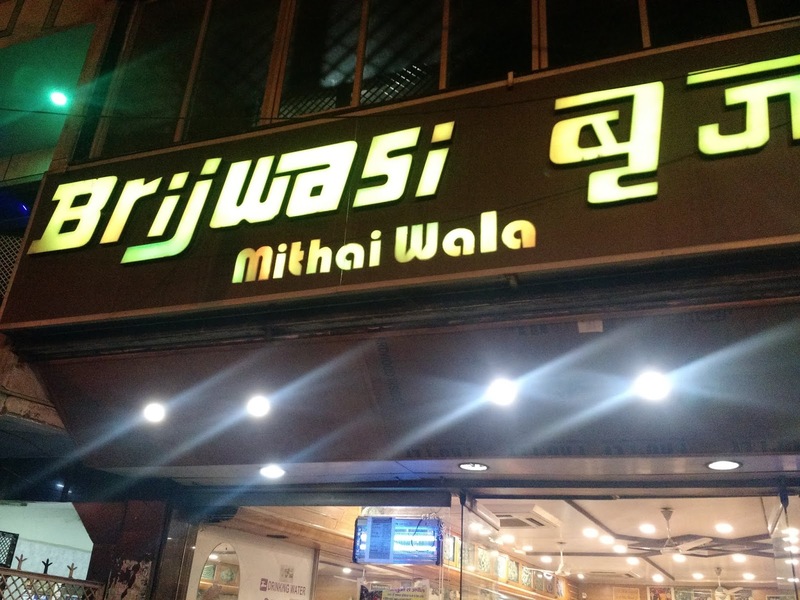 I bought peda prasad from here as well. A sweet shop close to Govardhan Temple was my stop to taste rabri rasmali and khoya rasmalai. I am still drooling. Vrindavan, a town close to Mathura is another place with Lord Krishna's legacy attached with it. Lord Krishna was brought up in this town away from his biological parents. 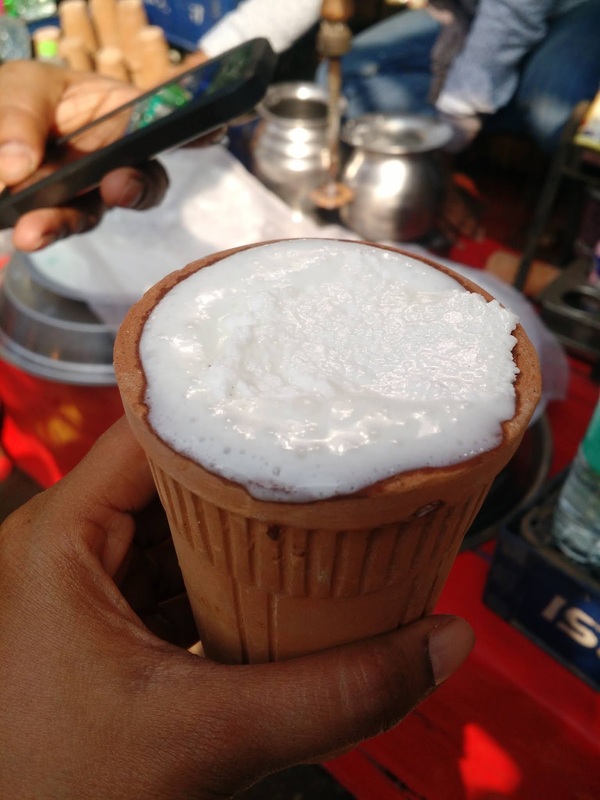 Home to several temples, Vrindavan too is famous for milk products and one cannot give a miss to lassi. 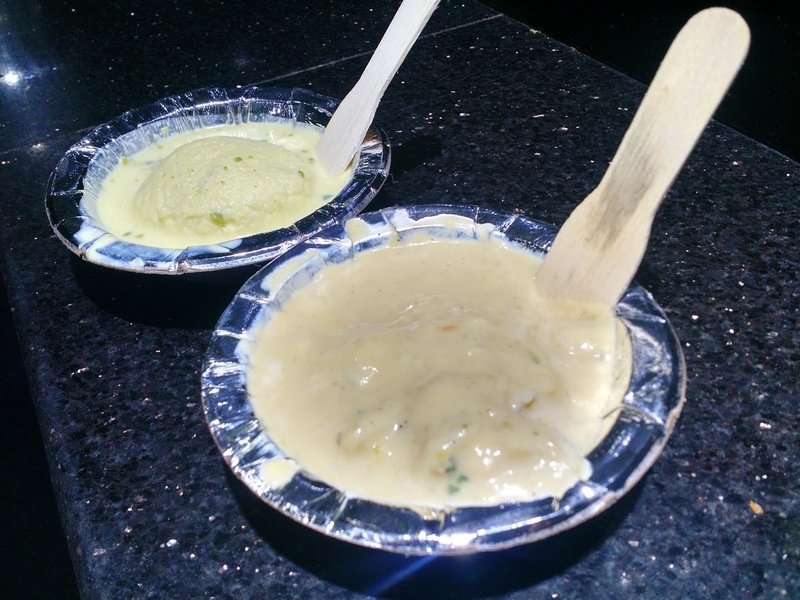 Served in eco friendly kullad (clay glass) the thick creamy lassi is a filling quencher. This was from a tiny shop in the crowded lanes of Vrindavan. 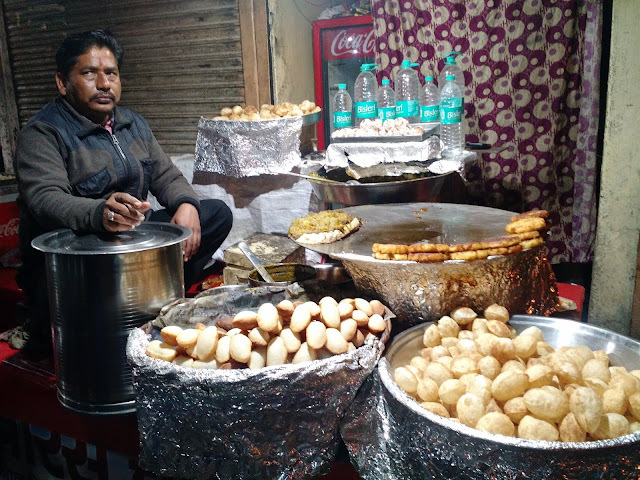 My evening snack comprised aloo tikki chaat in the lanes of Banke Bihari Temple. Chaat never disappoints you in Uttar Pradesh. Trust me! UP's main cuisine is hot and spicy which is cooled off by sweets. The spicy level can upset your stomach if you are not used to spices like me. Thanks to my stars I managed to stay put and braved the hotness of the cuisine. 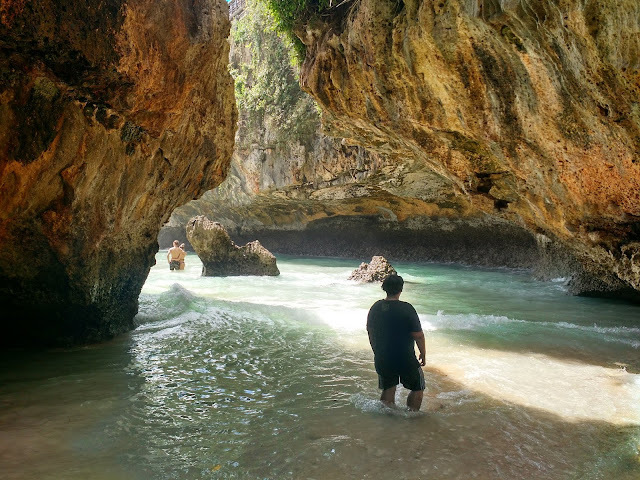 P.S- This trip of mine was in Jan 2018. 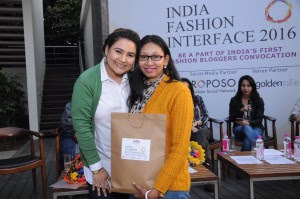 The post also made it to the top on Indiblogger and feature on the homepage. A knack for travel and exploring places, brought husband and me to Bali, the most beautiful island in Indonesia. 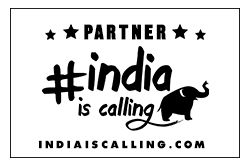 This was our first international trip together hence it was natural to be apprehensive and scared about lot of things; preparing a perfect itinerary being one of them. Those travelling for the first time should read about the preparations you need for Bali. We chose to do this trip on our own without help from agents. 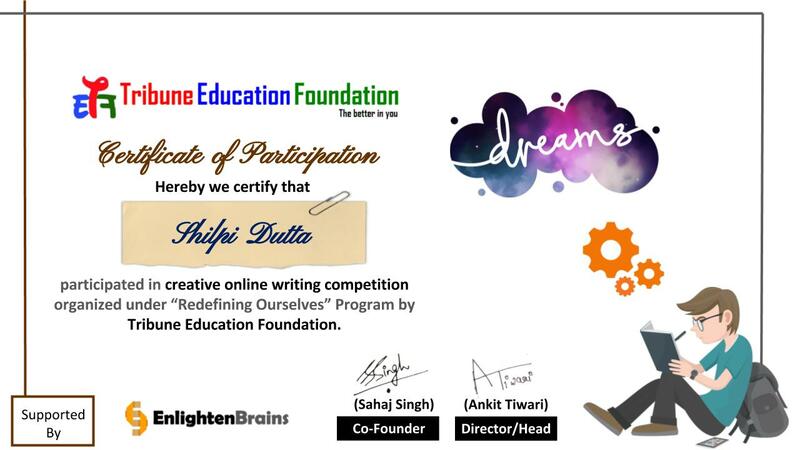 So we collected a hell lot of info from blogs, magazines and personal experiences to create a 6 day itinerary. 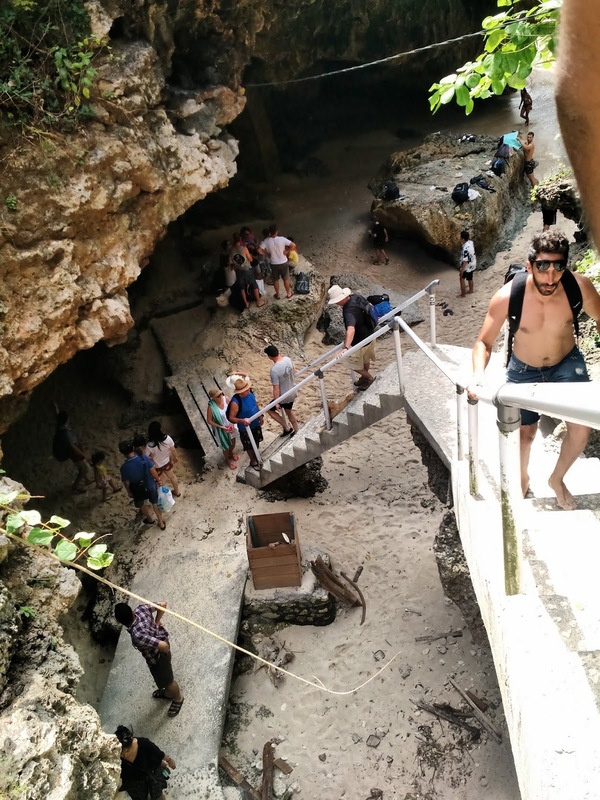 Keeping in mind the Indian culture and mindset, here is how you can spend 6 days in Bali. Day zero- The day you reach, you would not have much to do. (I utilized the half day figuring out bike renting shops, where to buy sims from, eating joints, markets nearby and of course the hotel property. Since I was unable to sleep in flight, I dozed off quickly at night on day zero). Depending on where you stay, you can alter your sightseeing plan accordingly. Few people prefer changing hotels while others stick to the same hotel. I stayed in Hotel Suris Boutique in Kuta (South Bali) and did not move out. Tip- Advisable to book your hotel in north region if you want to explore North Bali. Since it is quite a long distance from South Bali, it would be wise to stay in Singaraja, Lovina, Banjar Gitgit, Sembiran or, Sangsit. The best way to travel within Bali is to hire a scooter. However riding the scooter is too tedious for long distance. Plus there are traffic snarls. (You cannot jump traffic signals or you'd be required to cough up a hefty penalty. I had calculated the distance of each spot from my hotel and planned the trips suitably. -Post breakfast, head to Ubud to experience the beauty of two most revered places, namely Ubud Palace and Ubud Monkey Forest. Ubud Palace wont take more than thirty minutes while you can spend two to three hours in Monkey Forest. Have lunch in one of the fancy restaurants there. (I ate at a vegan restaurant). Spend some time exploring the art market and surprise yourself with the intrinsic paintings and artifacts that make great souvenirs to carry home. 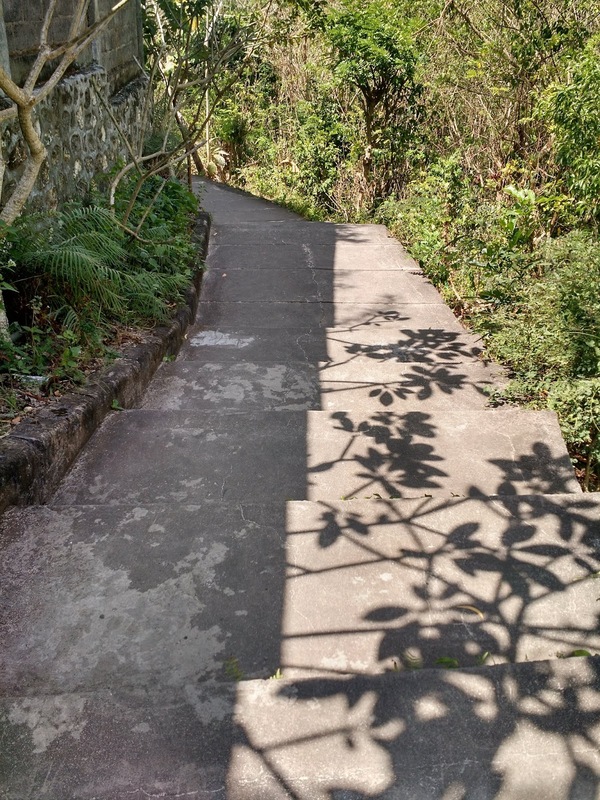 Know more about exploring Ubud here. -To watch the blue expanse of endless oceans and exotic beaches, head to Nusa Dua in the morning. 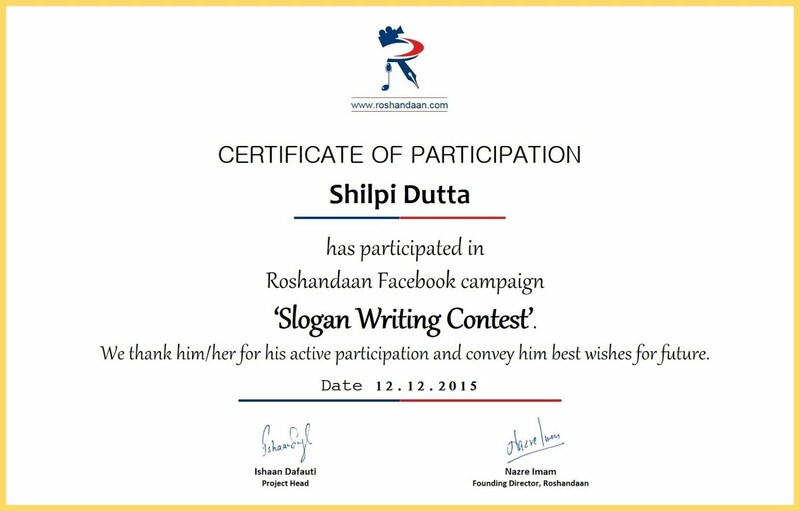 The journey itself is exciting as you would cross a toll bridge over the sparkling ocean. Being the Southern most part of Bali, it takes more than an hour to travel from Kuta to Nusa Dua. Tip: Carry sufficient food and water to the beach. 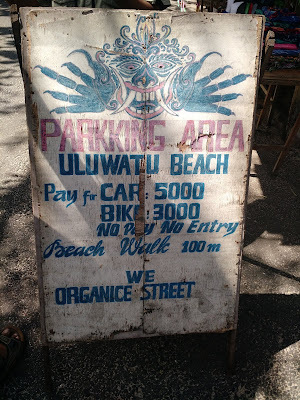 Though the shacks have a small market offering food and beach necessities, I suggest to refrain from them. Nusa Dua boasts the most scenic beach of Bali and the exciting Waterblow. Watch the surfers ride the waves while you soak in the sun. Water blow is a place to watch the nature's fury where water gushes into a rock cavity and blows up like a fountain. If History interests you, then you might want to visit Museum Pacifika, which is right at the beach compound. Know more about places in Nusa Dua HERE. Have lunch and rest in the shade. -Head to Tanah Lot Temple by 3 pm. Witness the Balinese procession and the beautiful temple against the gorgeous backdrop of sunlit ocean. The marketplace has several eating joints where you can have your dinner. (I had mine in Naty's). 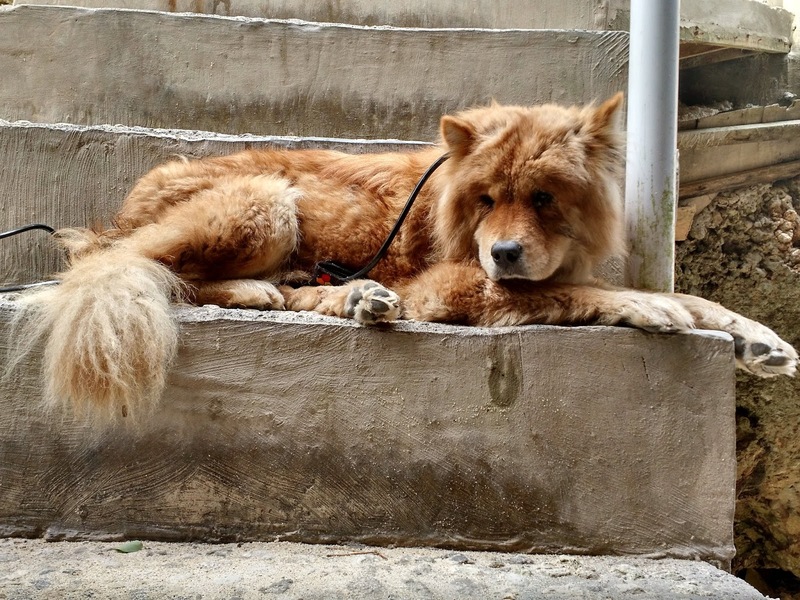 Jam packed roads and an action packed day will leave you tired. Head to your hotel and crash. -Post a heavy breakfast, drive to Uluwatu temple. Also known as Uluwatu Cliff Temple, this gorgeous beauty is an ancient sea temple on the edge of a cliff in Uluwatu. Frequented by monkeys, the temple holds a spectacular cultural show in the evening. 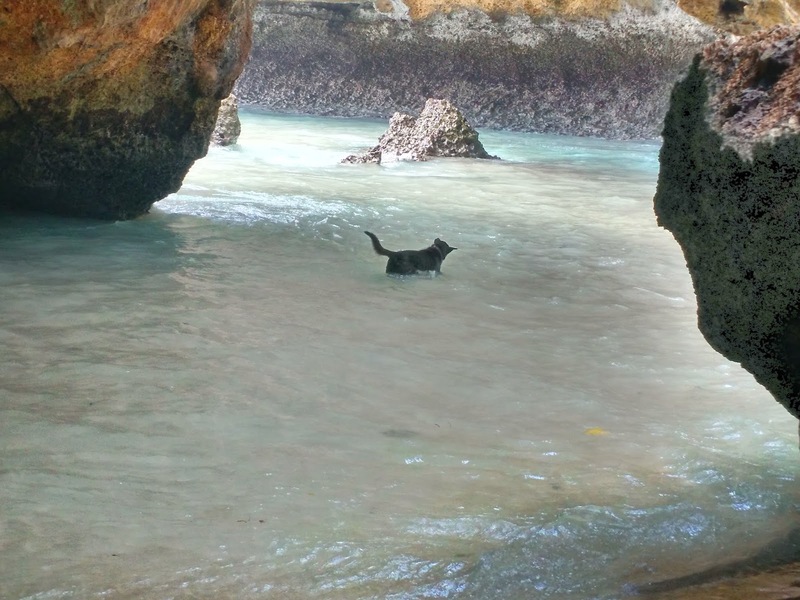 -Not very far from the temple is Uluwatu beach, popular for surfing, high tide and adventurous dogs. Have lunch at a restaurant on Uluwatu temple road. -Post lunch visit Malini beach resort (which was under construction in August 2017) for the gorgeous views. It is nature lovers' haven. 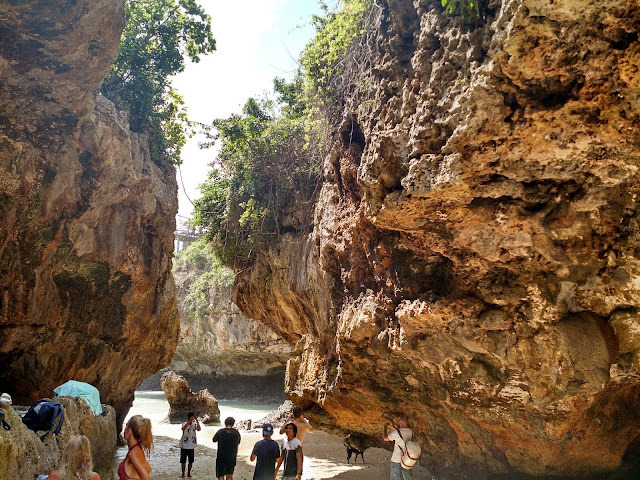 You can also visit Padang Padang Beach a popular surfing spot with sparkling white sand. It is not easy to reach this place and that makes it more exciting. -You can spend the evening in market, have dinner and return to hotel. Leave early morning from your hotel for trekking or rafting activities. (I had bought a rafting package from Bali Sun Tours). The river rafting expedition was to start from Giyanar, around 40 km from Kuta. The rice paddies and beautiful forests were a visual treat. Rafting or trekking activity would consume more than half a day. - (This was the last day of my stay in Bali and I wanted to make it the most of the day). 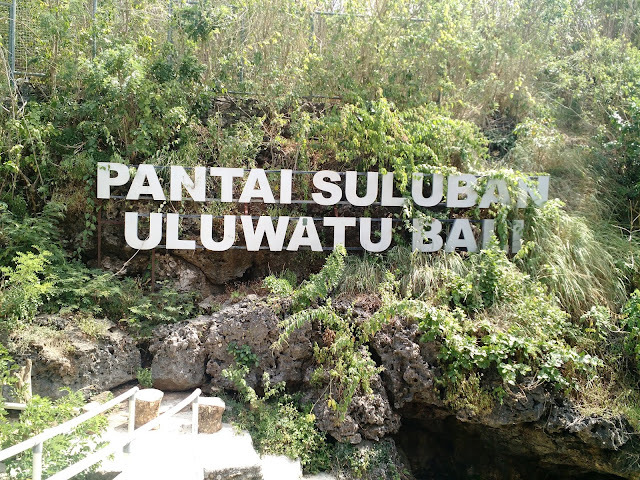 If you are a nature lover and want to watch a colorful paradise, visit the Bali Bird Park in Giyaniar. 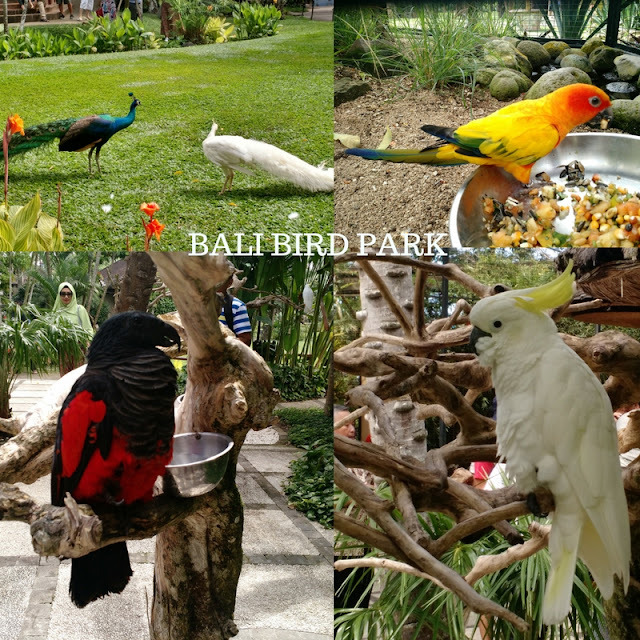 Right opposite to the Bird Park is the reptile park and close to it is the Bali Jungle Safari. -Post lunch leave for Goa Gajah, an ancient cave temple from 9th century. Get your bags ready, have breakfast and leave for the airport. Make sure you have enough time before flight departure since Bali's narrow roads are often choked with traffic. Stroll inside the airport and go on a shopping spree. Your itinerary can always be tweaked depending on your preferences or the places you stay in. For instance, you may not want to go rafting but go trekking the volcano mountains. You can stay in Jimbaran if you like the quiet village life. 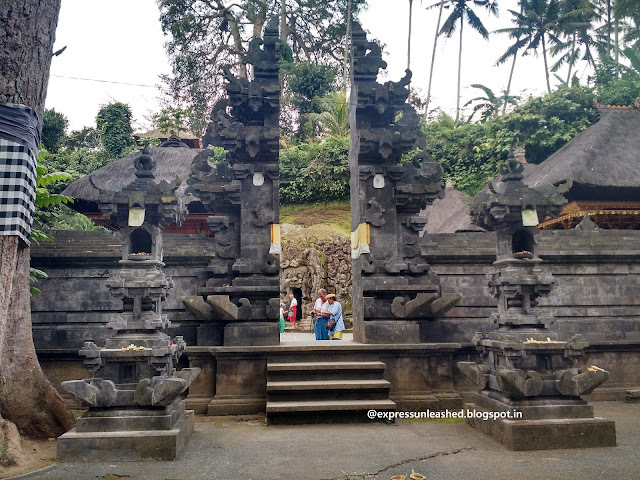 To visit Pura Danu Ulu Beratan temple, it is advisable to stay close to that place and not stay in South Kuta like I did. No itinerary is perfect, but its you who can make it perfect. Remember to research extensively and use your instincts in real situations. In case you need help with yours, I would be glad to help.